NEW YORK—Despite revenue, attendance figures, and viewing statistics showing it continues to lag behind as the least popular major sports league in the country, the NHL reluctantly completed a four-year, $20 million deal with hockey Tuesday to continue on as its sport through 2016. 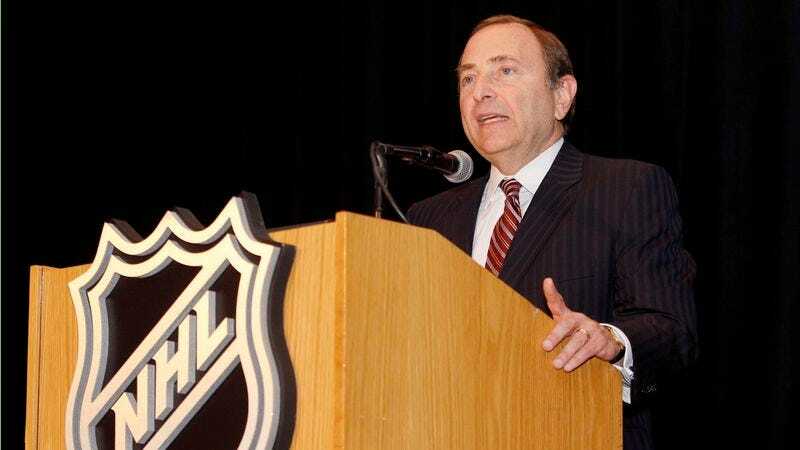 "We've struggled to survive under hockey for decades, so we realize it's not a realistic sport for a professional league," said Commissioner Gary Bettman, adding that the NHL is making "every effort" to work toward a suitable sport to play for the long term. "With an untenable infrastructure of cold arenas and so many franchises rooted in Canadian cities, it's impossible to switch sports right now, but I promise the NHL will get out of hockey as soon as it is feasible." Bettman refused to comment on what sport the league might go to next, but bantered happily for half an hour with a reporter who asked about volleyball.